A hard-hitting and hopeful story about the dangers of blind faith—and the power of having faith in yourself The Kevinian cult has taken everything from seventeen-year-old Minnow: twelve years of her life, her family, her ability to trust. And when she rebelled, they took away her hands, too. 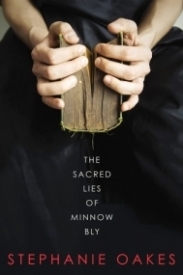 Now their Prophet has been murdered and their camp set aflame, and it's clear that Minnow knows something—but she's not talking. As she languishes in juvenile detention, she struggles to un-learn everything she has been taught to believe, adjusting to a life behind bars and recounting the events that led up to her incarceration. But when an FBI detective approaches her about making a deal, Minnow sees she can have the freedom she always dreamed of—if she’s willing to part with the terrible secrets of her past. Gorgeously written, breathlessly page-turning and sprinkled with moments of unexpected humor, this harrowing debut is perfect for readers of Emily Murdoch's If You Find Me and Nova Ren Suma's The Walls Around Us, as well as for fans of Orange is the New Black.